​​Jenna and Curtis Ehler have fiercely guarded their son's health since his premature birth nearly two years ago. The couple's initial excitement over Jenna's pregnancy had turned to concern in August 2014, when an ultrasound revealed more than they expected. "The doctor, after seeing the ultrasound said, 'Oh, surprise!' And then, 'Oh, surprise again!" Jenna said. She was carrying triplets, the result of a natural conception. "This pregnancy just went to extremely high-risk," the doctor told her. At 24 weeks, Jenna went into early labor and delivered three boys, Gabriel, Caleb and Joshua. Medical complications took the lives of Gabriel and Caleb within a few days. The lone survivor, Joshua, battled pneumonia, slow heartbeat, chronic lung disease and apnea during his 163-day stay in a Neonatal Intensive Care Unit. While coping with the devastating deaths of their boys, the couple turned their attention to Joshua. Around his third week, doctors told his parents that they weren't sure he was going to make it. "We rushed to the hospital and tried to prepare ourselves for it," said Jenna, a librarian from West Des Moines, Iowa. "But, he pulled through. It was really touch and go." When Joshua was finally discharged from the hospital, the family spent five months in isolation, allowing only close family members to visit. The couple has kept the baby home much of this winter, as well, concerned after seeing four other children – also born prematurely -- hospitalized with a virus. Jenna worries about Joshua, who turns 2 this summer and has a weakened immune system. He had a cold in December that lasted eight weeks, his mother said. "We live in a community where there are people who choose not to vaccinate," said Jenna, 30, who recalled the news about the measles outbreak at Disneyland. The couple decided against bringing the child to church because of fears that he would be at risk. When the issue came up on a Facebook page, Curtis decided to chime in, she said. "When you make this choice, it affects my child," said Jenna, recalling her husband's response. 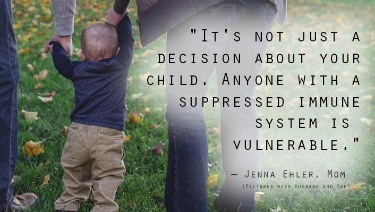 "It's not just a decision about your child. Anyone with a suppressed immune system is vulnerable." She and her husband were vaccinated as children. She believes that many people her age do not know what it was like to live with diseases like polio. "My generation, we don't know what it was like to be really sick because we were all vaccinated," Jenna said. "In our community of friends, anyone who has experienced a medical trauma tends to support vaccines." Jenna had not given deep thought to vaccinations before her family's tragic loss, and Joshua's ongoing medical risks.